We loved this cute note sent to us by Sundae the kitty. Here I am on vacation in Harwich on Cape Cod. They won't let me go outside because there could be coyotes. 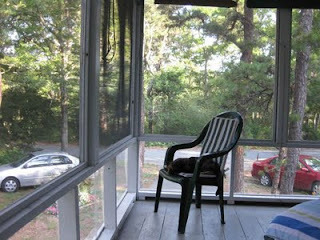 But - bird and chipmunk watching is very good from the screen porch! My mom was talking about what a wonderful job you did on the last newsletter! She was sharing it with her friends. Editor's note: Sundae earned the title "Supercat" when she found and eliminated some mice that her family didn't even know had taken up residence in their house.